Almost a week after the big race we returned home to find ourselves with a bit more free time than initially planned for - so we jumped on a ferry heading towards Powell River for another exciting adventure! Thursday August 21st. 4:30 PM - We return home from the Okanagan. Jenna is booked on a flight leaving for Calgary for field work at 9:00 am the next morning. 5:00 PM - We get the call. The field adventure has been cancelled, leaving us with 3 work free days! 6:00 PM - Thinking about adventure to Powell River for the weekend. 8:00 PM - Adventure confirmed, packing commences. 10:00 PM - Backpacks are packed and we're ready to go! Let's hope we didn't forget anything! Friday August 22nd, 9:40 AM - Missed the first ferry. Next connecting ferry isn't until 5:30 PM. 10:00 AM - Decide to take Monday off work to maximize adventure time. Let the adventure begin! We arrived in Powell River and were immediately whisked off to one of the coolest swimming holes I've ever been too. It came complete with a sketchy looking rope swing, and a rather terrifying cave. Just in case you aren't convinced - Chris will demonstrate (video comes complete with tarzan yelp). After a delicious salmon dinner with my cousin Jason we were off and planning the weekend's adventure. And then we have this brilliant idea - let's go on a three day kayak trip with a couple of hours notice, and be on the water by noon the next day! I'm not even sure how we did it, but by noon the next day we had all the food and gear packed and we were ready to hit the water. We didn't even forget anything! Well, except for the bug spray - but that's a minor detail. There's not much I can say that the pictures don't show. It was a beautiful weekend filled with seals, whales, crabs, star fish, sea bacon and sunshine! Yes, you read that right, sea bacon. Now we were too chicken to try it - but rumor has it if you properly disect and pull the veins out of a sea cucumber it takes just like bacon! I think I'll stick with the traditional kind! 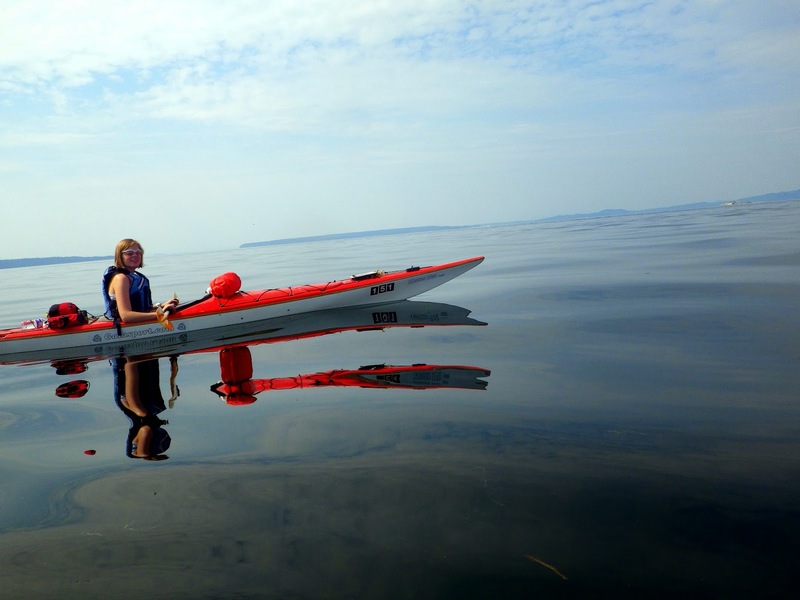 If you're looking for an amazing place to kayak (even paddle-free kayaking) - Desolation Sound is it! Thanks for being an amazing host Jason!! We owe you!